Christ Apostolic Church Youth Fellowship (CACYOF), Oke-Iye Districts Coordinating Council (DCC) headquarters, Ondo State is set to hold her annual 5days crusade tagged "The God of Our Fathers." The crusade will hold from Monday February 4th to Friday February 8th, 2019 by 5pm daily at Christ A/C Central Primary School, Ibaka. The Convener of the annual spiritual gathering, Pastor Ologunaye-Jacobs told CAC NEWS that the purpose of the open air crusade is to lift Christ up and allow Him draw men to Himself (souls winning). He further stated that as God has been helping, this year marks 11 year of God's faithfulness of the programme. He added that: "at the beginning, we use to have it at a place that could no longer contain the crowd and we have to move to the open field of a school." 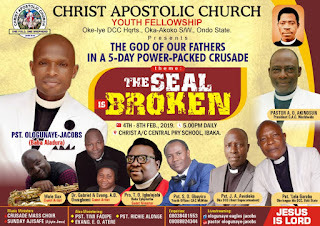 While speaking on the theme of the crusade which is "The Seal is Broken," Pastor Jacobs noted that the programme is tagged the seal is broken because there are lots of persons under the manipulation of the devil and its agents placing a seal of no escape on their supposed victims and God Is directing us there to cause all the seals broken through the undiluted preaching of God's word and prophetic prayers. "The expectations of the people is not far fetched, THEY SHOULD BE EXPECTING THE MOVE OF GOD EVEN MORE THAN YESTER YEARS AND EVEN MAINLY THIS LAST YEAR OWN WHERE A LOT OF PERSONS WERE DELIVERED AND MANY BROUGHT THEIR CHARMS after they've totally received the new light which is Christ Jesus. They should also be expecting raw miracles, signs and wonders. If God can heal ulcer and some other diseases and sickness last year, He can do more this year, "
"Last year was glorious when we have the youth officer of our great mission; Pastor S. O. Gbuyiro ministered to the mammoth crowd. It was a time of refreshing in God's presence where hundreds of persons gave their lives to Jesus Christ. This year, the Ministers who shall be ministering along with me there are Prophet IGBALAJOBI TIMOTHY OLATUNBOSUN (BABA EPHPHATHA, AYEMIONIBAJE) from Lagos, Pastor J. A. Awoleke, the newly transfered DCC Superintendent to Ọkà Àkókó, Pastor 'LOLA GARUBA, Ido DCC Superintendent, and a hosts of others. Music Ministers includes WALE SAX (Osun, LAGOS) DR. and Evangelist GABRIEL and BEATRICE OWAGBEMI and the crusade MASS CHOIR," the Cleric stated.